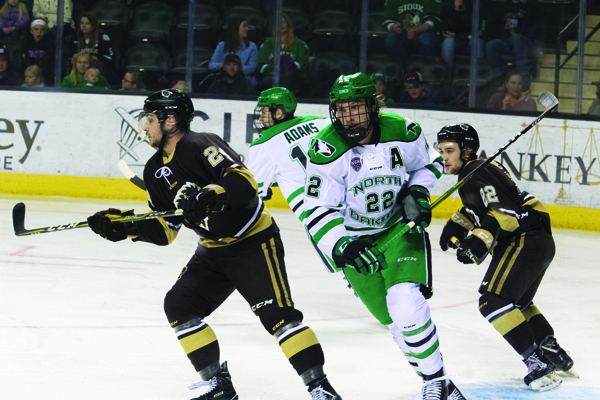 The University of North Dakota men’s hockey team opened up the 2018-2019 season in an annual exhibition game against the Manitoba Bisons. 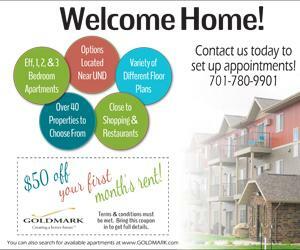 North Dakota had a full line up, playing all five seniors, seven juniors, six sophomores and five freshmen. 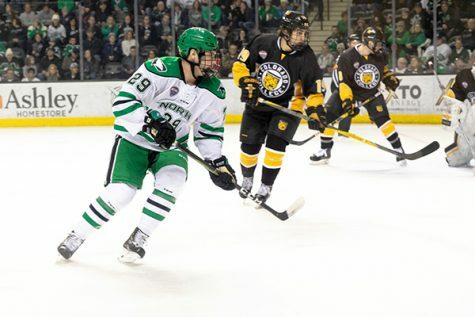 North Dakota dominated the game from the opening face-off until the final whistle. UND treated this game as a regular season game and not just an exhibition game. They were finishing their checks and blocking shots. UND controlled the game through puck possession and incredible neutral zone play. Through the first 15 minutes of the game, UND was leading in shots 14-2. North Dakota finally hit the back of the net when sophomore Grant Mismash banged one home on the power play with two minutes left in the 1st period. 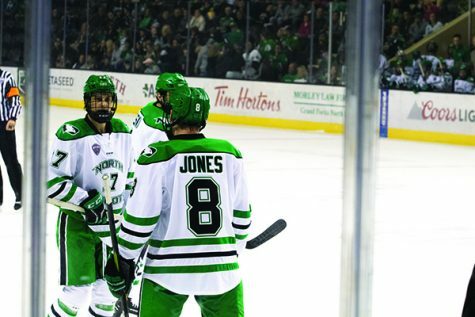 UND’s dominance was in full effect come the second period. 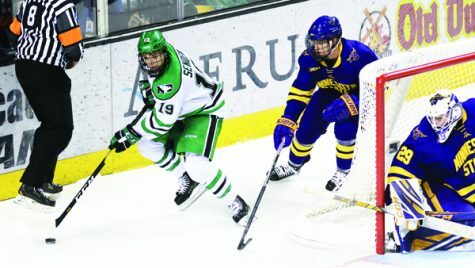 North Dakota added another goal when junior Dixon Bowen sniped one from the slot with a beauty of a feed from freshman Gavin Hain. Freshman goalie Adam Scheel saw ice time when he took over for sophomore Peter Thome halfway through the second period. Thome ended his night saving three of the three shots faced. The biggest takeaway from the second period, however, was North Dakota not giving up a single shot to Manitoba. North Dakota killed multiple penalties in the second period and still did not give up any shots. North Dakota, actually, did not give up a shot until 7:45 into the third period. Senior goalie Ryan Anderson took over for Scheel halfway through the third period. Scheel ended his night with one save on one shot faced. 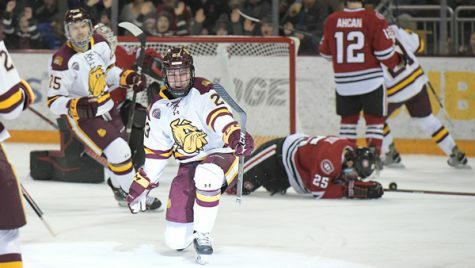 Anderson immediately faced pressure from Manitoba. Anderson made his first save, but the rebound went directly to Manitoba, making the game 2-1. Manitoba scored again on a breakaway a couple minutes later to tie the game up late in the 3rd period. Going into overtime, UND led in shots 50-8. 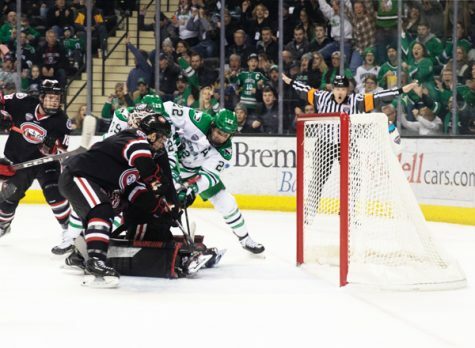 Gardner put one in the net three minutes into overtime to get the overtime win for North Dakota. 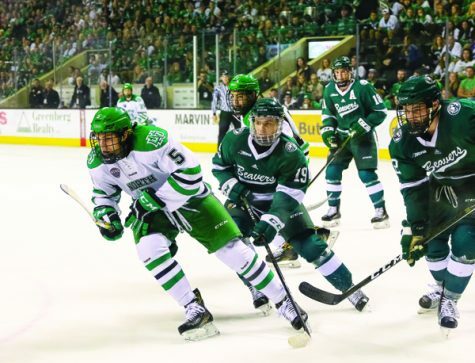 North Dakota did a lot of things well against Manitoba, but there is still plenty to work on before the regular season opener against Bemidji State this Friday. The game against Bemidji State on Friday will be in Bemidji before coming home to the Ralph on Saturday night to play the Beavers again.